Real estate property holds a special place in most people’s hearts. But how does one go about acquiring such assets? 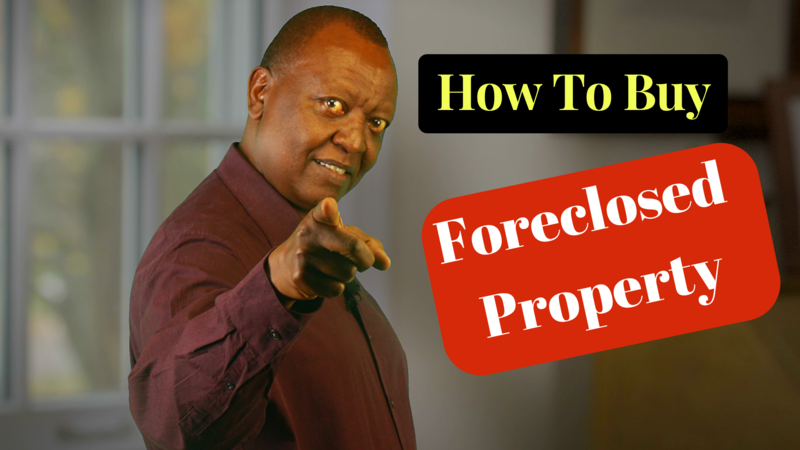 Well, there are many ways to skin a cat and in this article, is one of them; we look at how a prospective property buyer can profit by purchasing foreclosed property. Please CLICK HERE to watch on You Tube. Now more than ever is the time for investors, experienced and novices alike, to be buying foreclosed properties. So what do I mean foreclosed property? According to Wikipedia, Foreclosure is a legal process in which a lender attempts to recover the balance of a loan from a borrower who has stopped making payments to the lender by forcing the sale of the asset used as the collateral for the loan. Purchasing at foreclosure can be extremely rewarding but it is not without risks. The most important advice to heed is to do your research before you make a decision on the property or properties that you are interested in. There are three types of investment opportunity phases when it comes to foreclosures. The default phase is often referred to as the pre-foreclosure phase. Next is the auction or sales phase and then the Real Estate Owned (REO) phase. If you are negotiating directly with the property owner or lender before the property goes into official foreclosure, you are in the first default phase. Here, the property owner has ran into financial problems resulting in accumulation of loan arrears. Such a person may be desperate to sell so as to avoid going into full foreclosure, and the property being sold in an auction. In this phase you need to inspect the property, identify what the owner needs and the market value of the property, the repair costs and a potential sales price. If you can close on the property, make all the necessary repairs and sell it or rent it quickly, you can make a good deal of profit. Please CLICK HERE to watch on You Tube. Buying foreclosed properties at an auction is another option – this is generally for people who are more experienced in property foreclosure purchasing and have more financial clout. Although it can be very rewarding, it is not without risks. In this case, the property is publicly auctioned off to the highest bidder, and the process moves very quickly. If you bid at an auction, you compete against the property lender and other investors. Here it is imperative that you research the property before the auction. Although this is the only investment phase where you can literally save up to 45% off of market values, you do pay a price for this. Often, auctions are repeatedly postponed. And, even more importantly, it may be impossible for you to actually inspect the property. It is not unusual that your payment is requested immediately you win the bidding, sometimes even within hours of the purchase. If there is anything that leaves you feeling dubious about the property before an auction, let it go. Not researching properly can lead to a huge waste of time and money when it comes to auctions for these properties. Purchasing real estate owned properties might be the easiest route to go when buying foreclosed properties. This phase happens when the lender takes back the property into its possession to cut its losses and hands it over to a real estate agent to sell. In this case, the REO property will always have a clear title so you don’t need to spend time and money researching that. In addition, the lender will have all property taxes paid. Any necessary repairs on the property may or may not be done. The condition of the property is reflected in the selling price. Because this is more of a low-risk investment, you will probably not make huge profits here. Like I said, there are many ways to skin a cat and buying foreclosed property is just one of them. This path is much less riskier than developing property from the ground up and probably more profitable than buying ready built property in the open market. As always, you should follow the path that is most appropriate for your circumstances, skills and financial capability. Please CLICK HERE to watch on You Tube.